Several U.S. F-22 Raptor stealth fighter jets have arrived in South Korea for a joint air defense exercise. 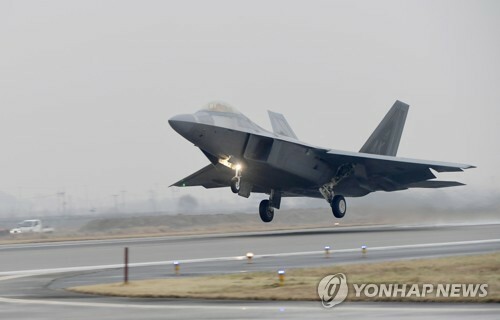 A military official said Tuesday that the fifth-generation, twin-engine, all-weather stealth tactical fighter jets arrived at Gwangju Air Base to participate in the annual “Max Thunder” drill that will begin next Friday. An F-22 Raptor is capable of precisely hitting key facilities after penetrating enemy radar fences. Its maximum speed stands at more than Mach two-point-five and its combat radius amounts to two-thousand-177 kilometers. Around 100 fighter jets are set to take part in the “Max Thunder” exercise, including South Korea’s F-15K fighter jets and the U.S.’ F-22 and F-16 jets.